'Bryce Leigh' ( Frank Chowning, R. 1973). Seedling FC 32. LA, 30" (76 cm), Midseason bloom. 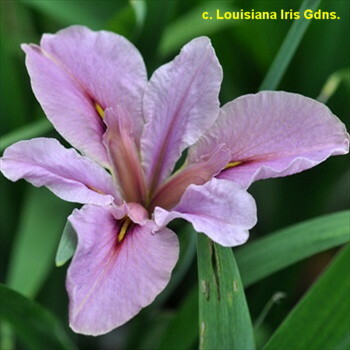 Pale lavender self (RHS 75D); narrow gold line signal bordered with narrow maroon line. Seedling X 'Louise Arny'. Melrose Gardens 1977. Honorable Mention 1978; DeBaillon Award 1981. From AIS Bulletin #226 Summer 1977 Introducing BRYCE LEIGH-An unusual color. Silvery opaque lavender, intensifying around the yellow lance signals. $15.00 NET. Melrose Gardens.